Stacie’s knowledge of what it takes to maintain consistently satisfied clients has positioned her to excel at National Medical Billing Services in her role as the Vice President of Customer Service. Stacie joined National Medical in 2008. She is responsible for the oversight of large client accounts, managing more than 50 account representatives whom she educates on technology and operation processes. Stacie produces numerous financial reports and analysis for her clients. Prior to National Medical, Stacie worked at McKesson for over 10 years as the Manager of Payment Posting and Claims (Anesthesia Division). Stacie earned a B.S. in Business from the University of Missouri, St. Louis. 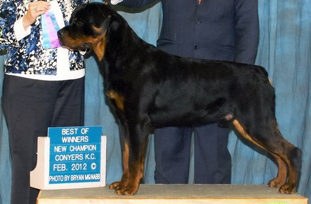 When not working, Stacie pursues her passion of Rottweiler breeding and showing. She owns four Rottweilers, all of whom breed internationally. Her dogs show nationally at major shows, including the prestigious Westminster Kennel Club Dog Show. In fact, some of Stacie’s dogs have qualified to show on the international circuit. In addition to her Rottweilers, Stacie is also beginning to show French Bulldogs.